This scan is off an original negative I own. I considered using it in the book, since it is an unseen candid and Ann Dvorak looks just lovely in her mid-1940s attire. However, the condition of the negative is not fantastic and I am not well versed in any sort of online photo editing. Plus, I have another 1940s candid neg that was an alternative and can be seen on page 223 of Ann Dvorak: Hollywood’s Forgotten Rebel. 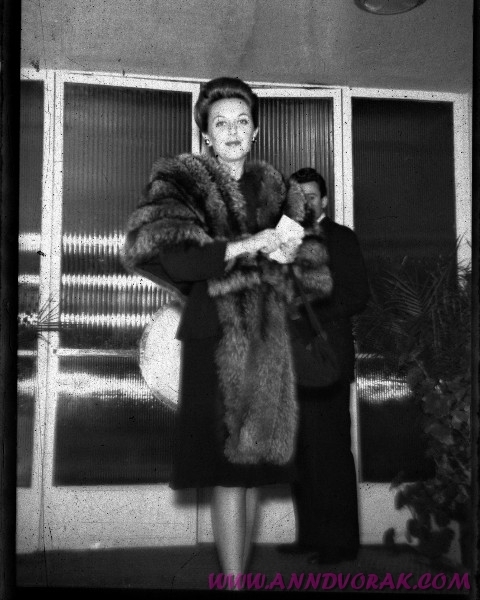 I am guessing she is coming out of some swanky Hollywood restaurant and that may be Igor Dega (hubby #2) holding the door for her. Despite the defects of the physical object, it’s such a great photo that it shouldn’t be hidden away in my filing cabinet. Just looked at this photograph and the one of Ann and the cast of “Abilene Town” surrounding Ida Eisenhower. Both from around the same time, one would think. Ann is wearing a fur garment in each one. But this one, here, looks more like a stole, or wrap and the “Abilene Town” fur looks more like a coat. In any case, ‘ensconced in fur’ is a look that certainly works for Ann.